If you are looking for an abrasion-resistant screen, then perforated plate is the best choice in unique and severe screening situations. our perforated screen plate is made to suit the specified screening application and screening equipment where these extreme screening situations occur. Impact and highly abrasive raw material are the primary reasons why perforated screen is a logical choice. Unlike woven wire cloth, perforated plate has a level screening surface, free from high points, which rapidly wear away in many severe screening applications. 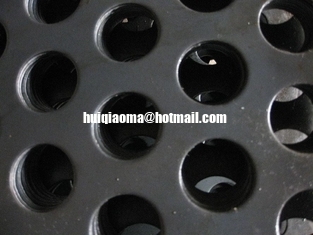 Perforated Plates are used for the primary screening of material, in particular, crushed rock. They are also used for scalping screening. They will endure rough, heavy screening and thus last longer than most other screening, products in this demanding environment. We can offer a wide range of Perforated Plates, either punched or plasma profiled in mild steel and stainless steel. All Perforated Plates are manufactured to order and this will mean greater lead time in availability. Type of material being screened. Overall size of plate (L+W). Type (square or round) and size of hole. Size of bridge between openings. Staggered pitch, or parallel pitch.